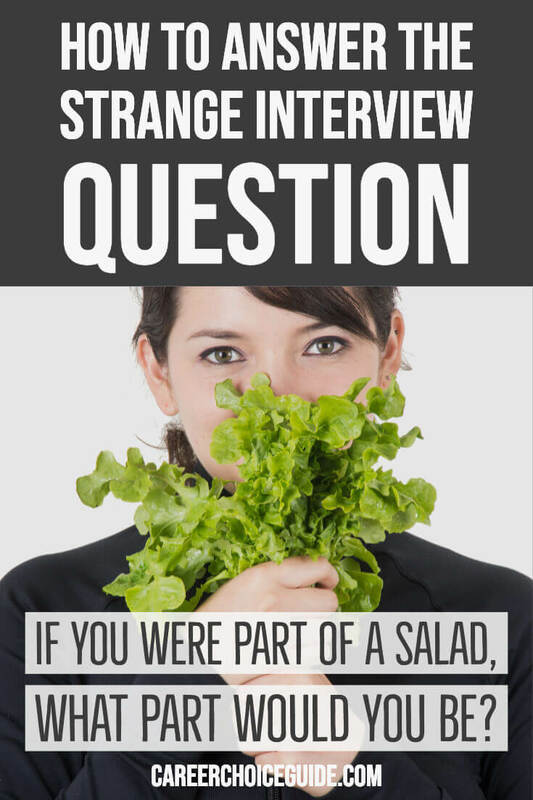 A collection of strange interview questions about fruit and salad with tips on how to handle these unusual interview questions. During a job interview for an office manager position, I was asked "If you were part of a salad, what part would you be?" At the time of the interview, I thought this question was completely crazy! I think I came up with a good, creative, yet honest answer quickly, though I did think about the question for days later. My answer was that I would be the salad dressing. My rationale was that the salad dressing was spread throughout the salad, on all the other different pieces, helping each one taste a little bit better. The salad dressing doesn't really change the parts of the salad, it just enhances them. Similarly, an office manager is there to support and enhance the other workers in the office. I think the question was asked to see how I could think on my feet, and test my confidence. It would have been easy to just shrug my shoulders, or say "I don't know". Instead, I just went with my gut. I didn't hem and haw, and second guess myself. I thought for a moment about it, and I was confident in myself, and I think that it worked out well. I did end up with the job! Being thoughtful and confident is the key to strange interview questions. There may not be any right or wrong answer, so just think about yourself, the job, and answer honestly. Cara, your answer to the question, "If you were part of a salad, what part would you be?" was perfect. I'm sure the employer was impressed with the answer as well as your ability to think on your feet. I was once asked, "If you were a vegetable in a salad bowl, how would you and the other vegetables escape the bowl?" If You Were a Fruit What Type of Fruit Would You Be? I was asked this past week what kind of fruit would defines me in terms of my career. I said an orange because of how it is made up of several pieces and it fits into sections that make a whole.